Don't you just hate it when you come across a site that's got a big banner that says "Under Construction"? Yeah, me too! NeonBlue Web Design's kinda permanently under construction though. I've been working on it for about three years now, but it's kind of never got very far, so it's kind of permanently under construction. I always seem to be too busy working on other peoples' to finish my own. You never know though, you might come back one day and find that it's finished! I'm passionate about pixels and code (yes, I probably do need to get out more!) and also about accessibility (if it's not accessible, I don't use it). 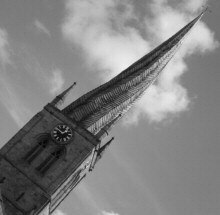 I'm based in Chesterfield, Derbyshire (yep, the place with the bent church spire), and NeonBlue Web Designs was always intended to be my attempt at providing professional web design services for folks in Derbyshire and beyond. There was a rather big flaw in my plans though, or rather three rather big flaws, and they were that there just aren't enough hours in the day (I work part time doing boring non-webbie stuff that pays the bills), I have a tendency to spend a fair amount of time in hospital, and I have this inability to say 'no' to any deserving cause that needs a website. Consequently I spend most of my time doing web sites for free, and in the process driving myself round the bend. Admittedly, it's all good practice, and over the past four years I've learnt an immense amount about web design, largely from my long-suffering, patient, and knowledgeable online friends, and got me some qualifications in web design too. One of these days NeonBlue Web Design will become a reality, but in the meantime between hospital stays and other dramas I potter around doing the odd site here and there and honing my craft, in preparation for the day when I'm finally ready to launch NeonBlue Web Design properly. One of these days I'll add a link to my portfolio so you can see exactly what it is that I potter around doing, but in the meantime, free free to check out my my blog where between my potterings when I get a few free moments I ramble on about whatever happens to be on my mind at the time. Inspired by you – designed by us me.